When it comes to living on the Gold Coast, Queensland – it is almost law that you must own a boat. With alot of boat owners regularly using their boats, that means constant use and wear and tear with their boat trailers. Is your boat trailer starting to give you a hard time towing, launching or retrieving? Are your boat trailer rollers starting to crack or split? Does your boat trailer winch need replacing? Or maybe you are just looking to convert your boat trailer from rollers to a bunk system? Roxom is an established boat trailer spare parts and accessories company which has been supplying Gold Coast residents for over 20 years. Our online boat trailer parts store provides you with easy access to do it yourself trailer repair parts, user guides and detailed information for boat owners looking to repair their trailers with high quality boat trailer spares manufactured locally in Queensland. Our plastic boat trailer parts are machined locally from HDPE Polyethylene. Plastic boat trailer parts have been proven to outperform and outlast rubber and PVC parts which have a tendency to split and crack which need constant replacing frequently costing you time and money! View – Different types of boat trailer rollersfor more information. Boat Trailer Parts Gold Coast Online Store, Stocks The Following Boat Trailer Spare Parts, Accessories & Hardware. 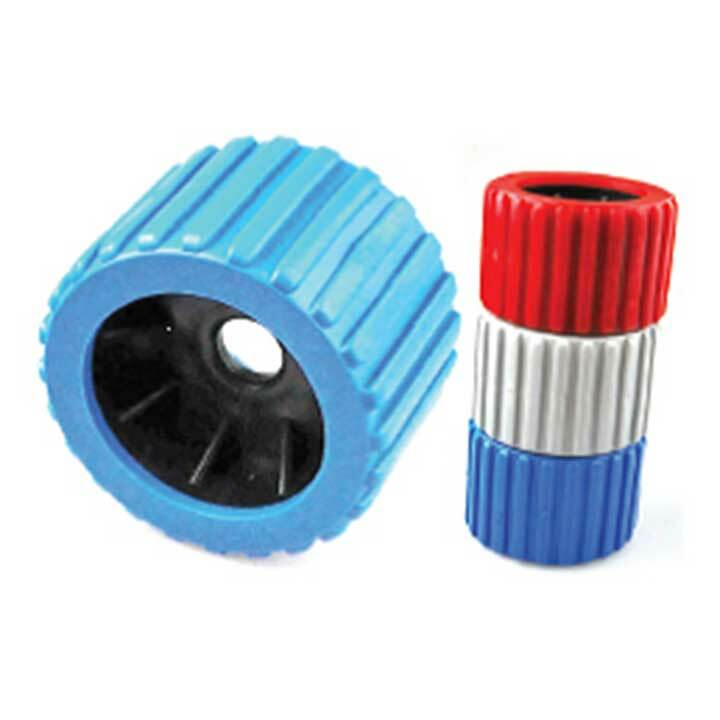 Roxom supplies a wide variety of Australian made Plastic Boat Trailer Rollers which are designed exclusively for aluminium boats and trailers. Our soft polyurethane boat rollers are a premium upgrade from your old rubber rollers for your fiberglass boat or PWC. Our boat roller range is designed to tolerate repetitive exposure to Queensland’s unique weather and boating conditions. Our boat trailer roller series includes the following range and profiles – Cotton Reel Rollers, Self Centering Rollers, Concave Rollers, Dog Bone Rollers, Parallel Rollers, Wobble Rollers and Bow Rollers. Click here to buy Boat Trailer Rollers Gold Coast. 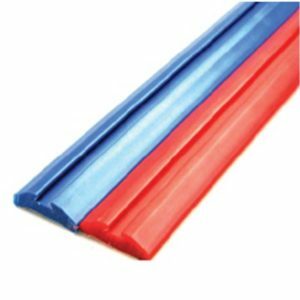 Our plastic Boat Trailer Bumper Covers are designed to suit small, medium and larger sized boats. Roxom’s bumper cover range is UV resistant and suitable for use in all weather conditions. Our Boat Trailer Bumper Covers will not only protect your boat and trailer but will add extra protection, style and performance. Our C-Section sizes start as low as 25mm and go up to the largest size of 65mm. Click here to buy Boat Trailer Bumper Covers Gold Coast. Our boat trailer skids are the perfect solution for anyone looking for a simple repair or upgrade to their boat trailer. Our boat trailer skid range comes in two profiles, Grooved or plain. Use these skids to replace your old PVC runners or use to simply screw into your existing wood or steel bunks for superb performance. No matter what length you require, we can supply all size skids to suit your needs. Click here to buy Boat Trailer Skids Gold Coast. Roxom boat trailer bunks are built to last. Our boat trailer bunks are extruded locally from a solid piece of plastic polypropylene material. Unlike other bunk profiles that have a hollow centre which provide great risk of splitting, cracking or collapsing our solid bunks will never have these issues. Our boat trailer bunks are extruded in two different profiles, ribbed and plain. Both profiles materials are identical and are UV resistant which adds further style, protection and performance to your boat trailer. Trailer bunks, when installed correctly are the best piece of boat trailer hardware to help launch and retrieve your boat into the water. Click here to buy boat trailer bunks Gold Coast. Roxom now offers customers the chance to purchase all their boat trailer spares, accessories and hardware all from one place. We specialize in offering the lowest prices on Ark boat trailer winches and jockey wheels. (Compare our prices guide). By demand we also offer customers the chance to purchase and replace boat trailer components such as brackets, spindles, trailer mudguards. Our trailer brackets range covers all profiles from flat roller brackets, single stem, twin stem, tandem brackets, double wobble brackets, quad wobble brackets, wood yoke stem and tube side adjusters. No matter piece of trailer hardware you are seeking, we have you covered. Buy boat trailer spares, accessories and hardware Gold Coast. Customer satisfaction is our top priority and key to the success of doing business. We aim to provide our customers with complete information about any topic you may have on boat trailers when you get in touch with us. Our goal is to provide our customers with discounted high quality boat trailer spare parts and accessories and to help them get their boat trailer in top working condition so they can spend more time out on the water with their family and friends.